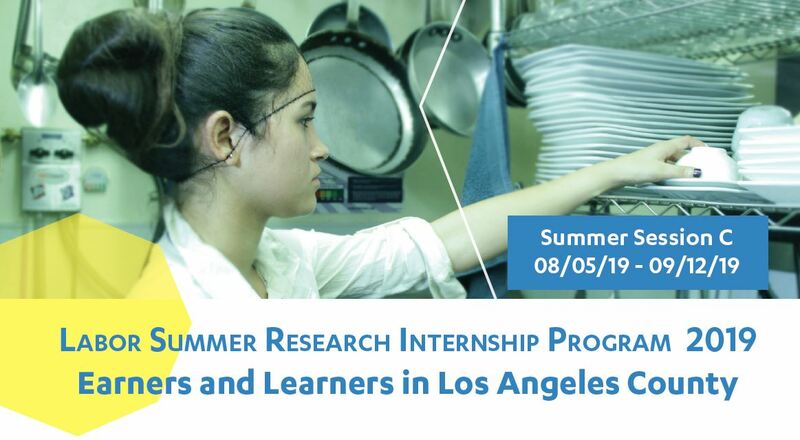 Description: Students engage in applied research focused on the social, economic, and political context and experiences of “earners and learners,” or those who work and attend college in Los Angeles County. We will examine how working students’ navigate barriers and opportunities in fulfilling their career and other goals. Participants will be a part of a UCLA Labor Center study to assess the intersections and the costs of working and attending school. Applied research methodologies (data collection, quantitative and qualitative data analysis) and engagement with key stakeholders such as earners and learners, school administrators, policymakers and advocates through info-graphics and interactive data workshops. 15 hours per week of off-campus field research assignments and develop a final research paper and public presentation. Students are required to attend 8 seminars (Two 4-hour sessions in week 1 and 6) on UCLA campus and spend 15 hours per week for 6 weeks working off campus on their respective field research assignments. Class meets every Monday from 10:00 AM – 2:00 PM on the UCLA campus. 8 units of course credit are valid for upper division credit; can also be used towards the Labor Studies Minor or related field (please check with departmental advisor first). Financial aid is available to qualified UCLA undergraduate students. All other students should inquire about financial aid at their home institution. Once students are accepted, they will receive Petition to Enroll (PTE) numbers in order to enroll in courses LBR&WS 194A and LBR&WS 195A. Priority Deadline: March 29, 2019 (UCLA students applying for Summer Financial Aid). General Deadline: June 1, 2019. Please note that International Students are NOT eligible for this program due to the F-1 Visa restrictions.